I have posted before about Ficklets and I keep posting because I think it's such a great product! Growing up with glasses, I remember the stigma behind them and how uncooll they were. The choices back in the day of the dinosaurs, well maybe not that long ago, were not fun and in fact, they were downright ugly. Kids have so many choices but never had they had the choice to customize their glasses with cute, adorable, fashionable and sporty charms like they do now. Many of the Ficklets are catered towards girls which is where I'd expect the desire to come from as let's face it, us girls are stylish and fashionable. 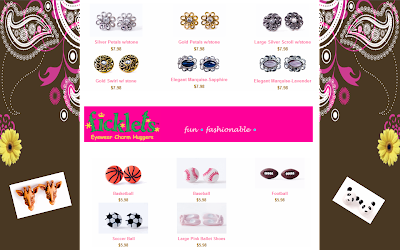 There are choices for boys such as if he is an avid basketball, baseball, football or soccer fan. The skulls under holidays would appeal to most boys too! For the girls, there are so many choices ranging from flowers, hearts, ballet shoes, animals, stars, food to shapes. I love the exotic animals and can imagine a little boy or girl sporting panda bears or giraffes on their frames. Ficklets were created to fit on the template area of the frames. They are easily attached and can be exchanged for a new set at anytime. The cost allows a parent to buy more than one set thus increasing the likelihood your child will be excited to wear their glasses. The selection under "classic" are very appealing to the tween, teen or older woman. They are stylish, elegant and add such a nice sublte bling factor that you can't pass up. I had to have some and they make my glasses look amazing! If you have a child who wears glasses or wear glasses yourself, check out http://www.ficklets.com/ and you won't be disappointed. The brilliant owner, Ros, is amazing and wonderful and great to work with! *Disclaimer: I was not paid nor compensated for this post. I just love Ficklets!